CoverSix Shelters, the defense and security division of RedGuard, is now offering turnstile modules as an addition to its product line of blast-resistant and robust modular buildings. "The innovative design of our new turnstile modules will provide facilities with customizable and scalable access point protection like they've never had before," said Ross Draney, market development for CoverSix Shelters. The turnstile modules work as plug and play individual units that can be added to a CoverSix Shelter 8' x 10' guard shack or 8' x 20' office to provide an extra layer of security and access control. The turnstiles attach individually or in groups as auxiliary components, providing a scalable, modular, expandable system for ultimate flexibility and security. "As security continues to become a more integral part of operations in refineries, on construction sites and in many other environments, we see the turnstile modules as another solution we can provide our customers to ensure they have the necessary measures in place to reduce risk and increase peace of mind," said Draney. CoverSix Shelters has long been known in the industry as a leader for providing blast-resistant, ballistic-protected and all-steel buildings built for rugged environments. To learn more, visit CoverSixShelters.com or call 855-REDGUARD. RedGuard is in the business of protecting lives. 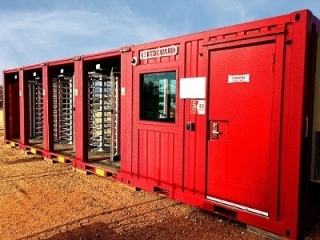 Established in 1998 as A Box 4 U, RedGuard is home to LeaseFleet, the world's largest fleet of successfully tested blast-resistant buildings; SafetySuite, the industry's premier line of fully customizable blast-resistant buildings; VersaBilt, customizable buildings that grow with your organization; CoverSix Shelters, our defense and security division, and SiteBox Storage, a division that offers unmatched logistics and one of the largest fleets of portable storage units and fully customizable on-site offices. Learn why RedGuard is the industry's safety authority at RedGuard.com.